The key to paralysis recovery exercises for stroke rehabilitation is passive movement. In this article, you’ll learn the difference between active and passive movement and the reason why passive exercise helps you recover from post stroke paralysis. Then, we’ll share some examples of paralysis recovery exercises and a tool that can help. Sound good? Let’s dig in. Active rehab exercise involves doing a movement on your own. Passive exercise involves assisting yourself through a movement. Passive exercise is perfect for stroke survivors recovering from paralysis because it does not require movement. Rather, passive exercise involves using your ‘good’ side to assist your paralyzed muscles. And if both sides of your body were affected by stroke (in the case of multiple strokes or brain stem stroke), then a therapist or caregiver can assist your paralyzed muscles. Passive rehab exercise is a great solution to post stroke paralysis because it activates neuroplasticity. Neuroplasticity is the mechanism that your brain uses to rewire itself after injury. When stroke damages part of your brain, neuroplasticity allows other parts of the brain to take over. Neuroplasticity is how you regain function after stroke. And you can activate neuroplasticity through repetition. Repetition is critical to your success during rehabilitation. If you want to regain movement after paralysis, then you need to practice stroke exercises over and over and over as much as possible. At first, you need to start with passive exercise, but eventually you can start to regain small amounts of movement. With enough time (lots of time) and practice, you can progress to active exercises. It all starts very slowly – but trust that your brain is on your side. As long as you’re practicing your rehab exercises with high repetition, then your brain will start to rewire itself and relearn how to control your muscles. Luckily, doing passive exercises isn’t complicated. Simply find active exercises and assist your affected muscles through the movements. Use your hands to lift your affected leg up into your chest and hold it for one second. Then, slowly lower your leg back down. This movement is passive because you assist your affected leg with your arms. To make the movement active, you simply raise your leg without the help of your arms. 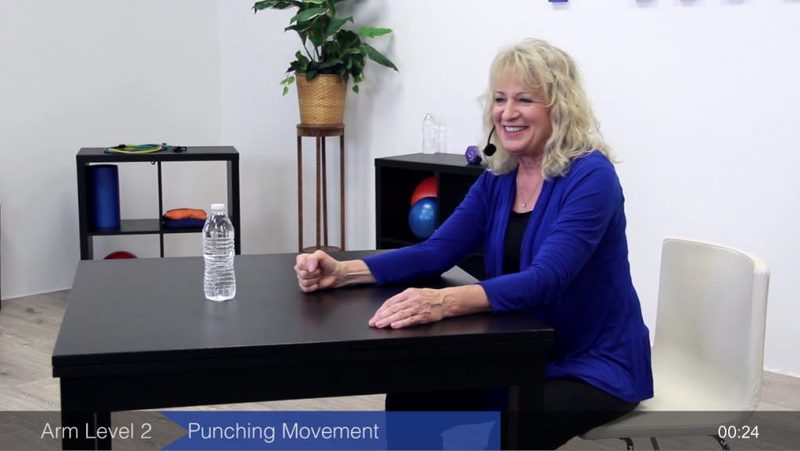 To perform this exercise, slide your arm across the table to ‘punch’ the water bottle, and then pull your arm back. This exercise can easily be turned into a passive exercise by using your torso to push your arm forward. It can just as easily be turned into an active exercise by initiating the whole movement with your arm. These exercises help restore movement after post stroke paralysis by relinking your mind to your muscles. To make the most out of your paralysis recovery exercises, you need to understand that the point of rehabilitation exercise is to relink your mind to your muscles. Rehab starts in the brain, not the body. Your muscles aren’t weak. Rather, your brain is just having a hard time telling your muscles how to move. The more you practice passive rehab exercises, the better your brain will get at communicating with your muscles. With enough repetitive practice, you can restore your mind-muscle communication and start to regain movement. If you’re looking for a tool that can help with stroke paralysis recovery, then our FitMi can help. FitMi is designed to help you achieve the high repetition necessary for recovery – and you can use it even if you have no movement. Simply start by using it passively and then work your way up to active exercise. 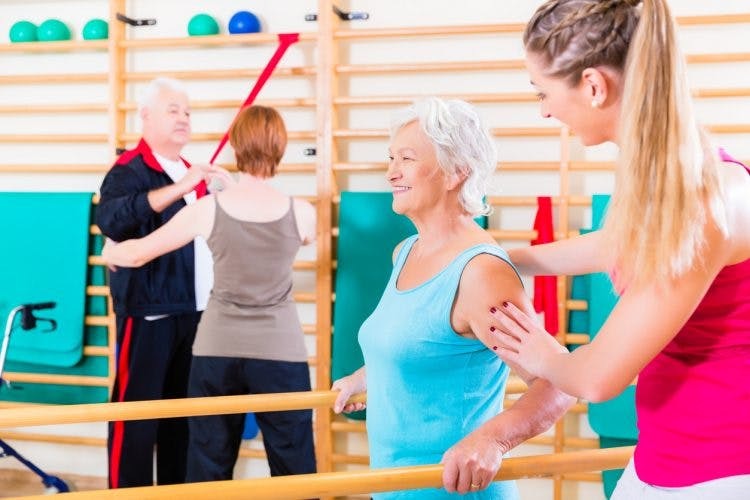 For most stroke survivors, daily rehab exercise is critical to success. Frequent exercise is the best way to see results. However, some stroke patients find that exercise 3-4 times a week is all they can manage, and that’s fine. As long as you’re getting your reps in consistently, you’ll see results. Consistency is key to success because it reinforces the new connections that you’re building in your brain. For this reason, you’re much better off exercising for 10 minutes every day than exercising for one hour every other week. So you’ve heard us drill the point enough: practicing passive rehab exercises repetitively will help you regain movement after post stroke paralysis. But there’s another step that you can add to this formula to boost your results even more, and it’s called mental practice. Mental practice involves imagining (or visualizing) yourself doing the movements you want to get better at. This helps activate neuroplasticity just like physical practice does. Studies have shown that combining mental practice with physical practice leads to even better results. For example, you can visualize yourself walking if you want to get better at walking; or you can visualize yourself doing active hip flexions if you want to get better at hip flexions. We recommend doing mental practice for 5-10 minutes before your rehab exercise sessions. This way, you can get yourself ready for the exercises by mentally rehearsing it first. This activates neuroplasticity to the max and helps you see even better results. Although the formula is simple, it requires lots of hard work and patience. Believe in yourself and a higher recovery. Trust that as long as you put in the work, the results will come. Newer Will Incorrectly Practicing Stroke Exercises Lead to Bad Results?